Sue Wilson Reports: Who's Accountable for Reckless Broadcasting? Who is Accountable for Reckless Broadcasting? A couple of weeks ago, through my non-profit project, the Media Action Center, I filed a Petition to Deny the renewal of the broadcast license of a radio station in Sacramento because, simply put, they killed a woman. While the radio station's insurance company paid millions after they were found guilty for negligence in a lawsuit, the station itself never paid any price, as you or I would, if we had killed someone, even accidentally. The death, however, can barely be called an accident, as the jury discovered. And now, it's up to the FCC as to whether they force real accountability in this matter, by denying renewal of the station's license to broadcast over our public airwaves. In 2007, Entercom Sacramento's KDND sponsored a water drinking contest called "Hold Your Wee for a Wii." The idea was to compete to see who could drink the most water without peeing; "last man standing" would win a Nintendo Wii! But the stunt went bad, so bad that 28 year old mother of three, Jennifer Strange, died as a result. Her family hired a lawyer, who did two things: he filed a lawsuit against Entercom and he wrote to the Federal Communications Commission (FCC) asking that the station's license be revoked. The attorney, Roger Dreyer, won his lawsuit and a $16.6 million dollar award for the family in 2009. The jury in William A. Strange v Entercom unanimously decided Entercom Sacramento was 100% liable for Mrs. Strange's death. The jury understood that her death was caused by no mere accident, but rather more like by a reckless driver careening down the wrong side of a busy freeway doing 120 mph. See, the radio staff knew their water drinking stunt could kill someone; they'd made fun of another water drinking death on the air just days before they planned their contest. They knew it was dangerous, but they never bothered to tell that to the contestants. They even went so far as to hide the release form that outlined the dangers (and the rules,) instead, giving contestants a generic release form so vague it couldn't hold up in a court of law. Next, Entercom staff ignored those rules, which said each contestant would drink 32 ounces of water per hour (which would be safe.) But good radio meant the contest needed to finish by 10 AM, the end of their Morning Rave program, so they started the contestants with 48 ounces of water an hour (which is not safe.) But people were still not peeing quickly enough, so the radio shock jocks pulled out all the stops, and doubled that amount, making water into a lethal potion. People were getting sick, really sick, suffering severe headaches and vomiting into wastebaskets, while callous KDND staff took pictures. There wasn't even medical personnel present, like there was supposed to be. Even after the contest, when Mrs. Strange told the "Morning Rave" crew she was too ill to drive home, a Deejay abandoned her to the station's lobby. She did drive home. Then died alone there just hours later. When John Geary, then market manager for Entercom Sacramento, learned of her death, he instructed his staff not to call the other contestants to warn them of possible health risks. He did ask his station manager to get on the phone - and start calling lawyers. It is the most reckless broadcasting I have ever seen. I covered the trial, and can say with certainty that finding Entercom liable for Jennifer Strange's death was a no brainer for the jury. Entercom, with revenue of about $400 million per year, did not appeal the case, and its insurance paid the $16.6 million dollar award. But six years after the incident, the Federal agency tasked with protecting the public interest in broadcasting has done nothing about the request to strip Entercom of its license. Instead, the FCC has granted Entercom several more radio licenses across the U.S.
Just after I announced I would be filing the legal Petition to Deny, local former radio guy and Sacramento Bee columnist Bruce Maiman opined in his column that MAC was angry because the station hadn't really been punished, given that Entercom didn't lose any money, and said the whole purpose of having insurance is to defray the cost of doing business (although it's obscene that he regards a negligent death as merely "the cost of doing business" for a radio station.) He questioned what more could possibly be gained by denying the station its license. It's true, denying Entercom its license will not bring Jennifer Strange back or personally benefit her family. But it has the potential to be a benchmark for the entire broadcasting industry, sending a clear message of what operating "in the public interest" means. If I drive recklessly and kill someone, my insurance pays, but I will lose my license. If a radio station broadcasts recklessly and kills someone, shouldn't it, too, lose the free license it's been granted by the people to use our public airwaves? Broadcasting is a public privilege entrusted to precious few private entities. Radio and TV stations privately own their equipment; the public owns the air frequencies over which signals are broadcast. The frequencies, called public airwaves, are like public highways: just as we own the highways and receive licenses to drive, we own our public airwaves, and stations get licensed by the Federal Communication Commission (FCC) to broadcast. The licenses are free, but stations are only granted lucrative and scarce licenses IF they agree to "serve the public interest" in exchange. When stations do not keep that bargain, the FCC should rescind their licenses. To actually deny KDND's license, the FCC must find Entercom lacks the character qualifications necessary to be a broadcast licensee. This would include a pattern of activity, and as one source in the Maiman piece pointed out, KDND hasn't killed anyone else in a contest, (as if radio stations have to become serial killers before they lose their privilege to broadcast to our communities.) But Entercom, in its quest for ratings and profit, regularly ignores boundaries of respectability, committing repeated violations of indecency, payola, defamation and more. The FCC then fines them a few dollars, and the broadcast Licensee waltzes away laughing to make a few million more. While this incident occurred in 2007, radio licenses are renewed only once every eight years, and November 1 was the deadline to challenge license renewals in California. We gave the FCC as much time as we could to act on its own. The FCC's decision could impact the entire industry, but don't look for a quick answer: Irene Stolz filed "Petitions to Deny" the licenses of all six Entercom Sacramento stations on November 1, 2005, at the end of the last license renewal period. The FCC has never processed them; in fact, the agency has allowed Entercom to operate in the Sacramento market without a renewed license for the past eight years. Had the FCC adjudicated those license challenges in a timely manner, it is entirely possible that Jennifer Strange would be alive today. Wednesday, I will be going to the FCC to hold its feet to the fire over this and other matters. 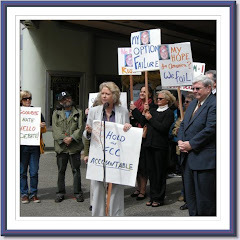 I'll be there to welcome the new FCC Chair, Tom Wheeler, and hope that his arrival signals real change at the FCC. Plus, I'll be screening my film Broadcast Blues at the New America Foundation, and holding a panel discussion with Free Press, Common Cause, and the National Hispanic Media Coalition to discuss ways to hold not only broadcasters, but the FCC itself accountable to the public interest. Join us if you can, and if you cannot, sign our supporting petition to tell the FCC enough is enough: radio stations can't just kill people and expect to continue to broadcast on our publicly owned airwaves.